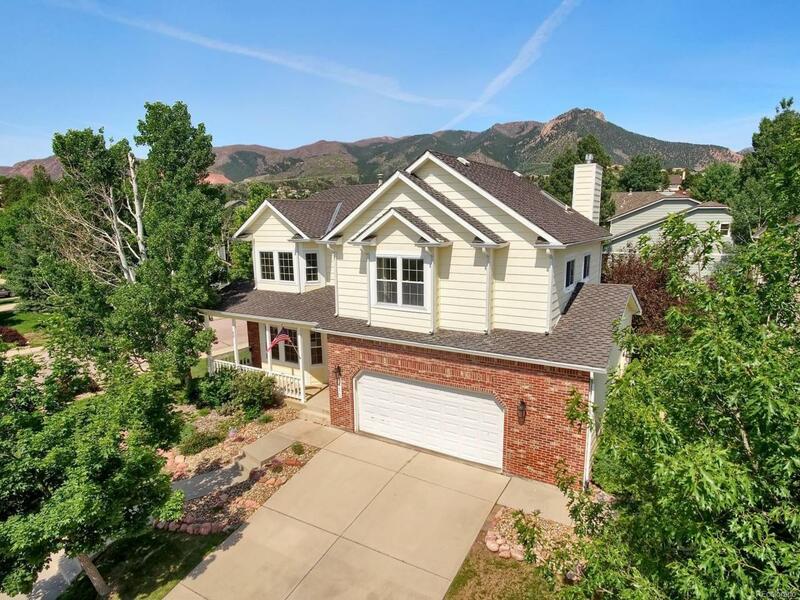 Step inside this beautiful 2-story home nestled on a cul-de-sac in Peregrine Valley with Blodgett Peak views. The gourmet kitchen provides granite counters, upgraded stainless appliances, walk-in pantry & dining nook. Unwind in the family room boasting soaring ceilings and cozy gas fireplace. Enjoy summer evenings on the pavered back patio with custom pergola. Master retreat offers Blodgett Peak views, a luxurious 5pc bath & his and her walk-in closets. French doors lead to the study that is perfectly positioned for a quiet work space. The finished basement provides a 2nd family room, 4th bedroom, exercise/dance studio with mirrored wall & rebound flooring and storage room. Beautifully updated, this home offers a renovated kitchen, updated bathrooms, updated lighting & vinyl windows. Situated in the foothills of Peregrine, you will enjoy mountain views, mature trees and wildlife yet you are minutes from I-25 with easy access to downtown Co Springs or Denver, USAFA, shopping and dining.